There's a reason us Scottish folk can't do Dry January. That reason is Burns Night and consequently Whisky. (No E folks, no E). Me and whisky go back a long way. It's been a big part of my life as long as I can remember. Before you start worrying, I wasn't drinking it as a toddler, rather I'm a farmer's daughter and my Dad's main crop was malting barley. Our family farm is on The Black Isle, overlooking the Beauly Firth. The next Firth as you head north is the Cromarty Firth and following that the Dornoch Firth. But why am I telling you all of this? The reason being is that all of our barley was sold locally so there is a chance that some of it made its way to Balblair Distillery on the coast of the Dornoch Firth. 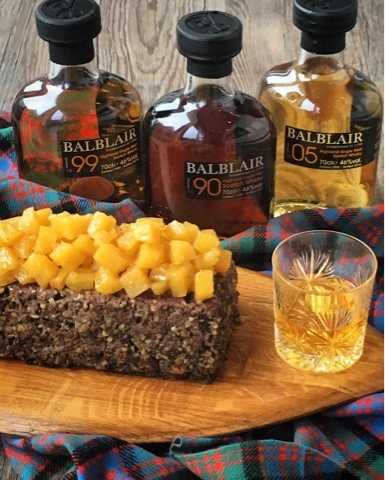 So when Balblair got in touch to ask if I'd like to come onboard and work with them to celebrate Burns Night I felt that I'd come full circle and there was an immediate connection. Us Highlanders like to stick together. When it comes to Burns night there are many traditions, but the tipple of choice is always Whisky. Famous for producing award-winning Highland Single Malt Scotch Whisky, Balblair is the ideal dram to toast the Bard with. Whilst many whiskys are sold by age, Balblair is sold by Vintage resulting in strongly individual whiskies which capture the unique essence of the year in which they were laid down. Both the bottles and boxes are absolutely stunning in vibrant colours with an innovative magnetic door opening mechanism for the box. Matures in American oak ex-bourbon casks and Spanish oak ex sherry butts Blablair Vintage 1990 2nd release is truly exceptional. This luxurious expression is the perfect after dinner treat. This beautifully developed Balblair Vintage boasts the classic, fruity, floral and light heart of Balblair set against a darker, richer backdrop of further maturation in Spanish oak. Haggis are of course small four legged creatures that live in the Highlands. They have two legs shorter than the others so they can run around the mountains without toppling over. Catch one yourself by chasing it the opposite way round the mountain or buy a free range one from your butcher. Scottish Neeps are Turnips, but not wee white new Turnips but rather the large purple skinned yellow/orange Swede. Tatties are potatoes and must be of the mashed variety. For a twist on tradition I've used Scotch Beef to make a Beef and Haggis Meatloaf which is then topped with Neeps cooked in a Balblair, Butter and Brown Sugar glaze. I do hope Rabbie would approve. Remove the haggis from its outer wrappings and cut it into small cubes. 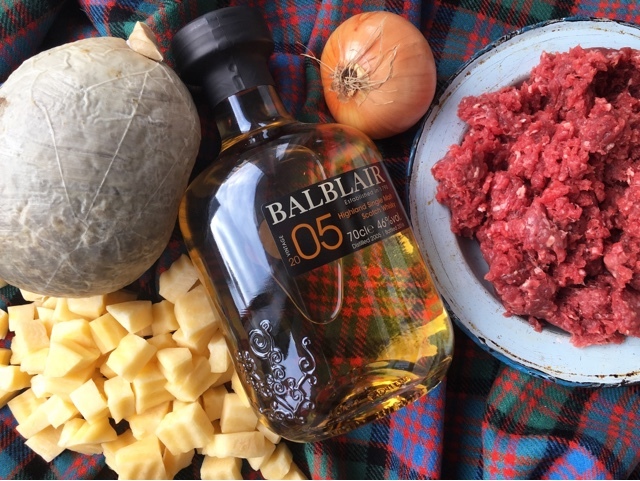 In a large bowl combine the Scotch Beef Mince, Haggis cubes and chopped onion. The most effective way to do this is to get your hands in and give it a thorough mix. Press the meatloaf mixture into a non stick 2lb loaf tin and cook for 45 minutes. Place the cubed neep in a pan with the butter, sugar, Balblair Whisky and enough boiling water to barely cover. Bring to the boil and cook uncovered over a high heat until the neep is tender and the water has evaporated to leave a buttery glaze. This will take around 30 minutes. 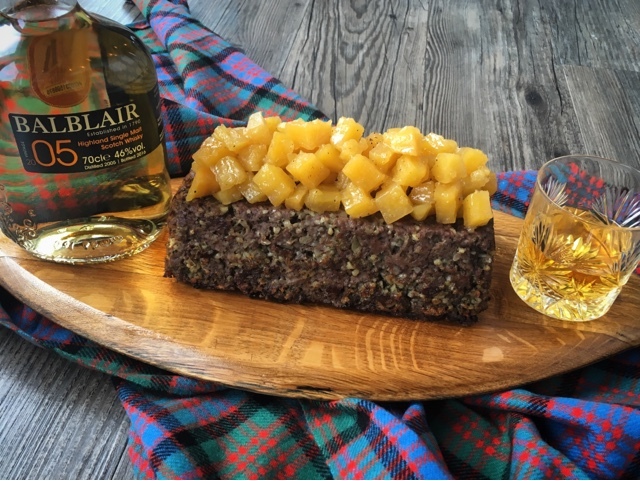 Turn the Scotch Beef and Haggis Meatloaf out onto a board and top with the Whisky Neeps. Serve the meatloaf sliced with extra Whisky Neeps on the side and a generous dollop of Mashed Tatties. Accompany with a dram of Balblair. Disclosure: This is a commissioned recipe for Balblair. As always, all views expressed are my own. I have just recently discovered Balblair whisky, and had a whisky tatsing party with some girlfriends. Lets just say they were very impressed. I can't believe that you shared it. These bottles are all mine - but I'll let my Dad have a couple of drams! 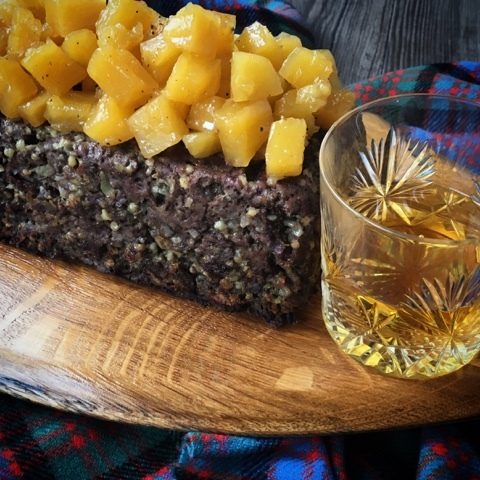 This is a fantastic idea of using Scotch beef and haggis meatloaf with whisky neeps. Thanks for making this a real deal. The Haggis works so well in the meatloaf, a perfect introduction to anyone who isn't sure they like it on its own. That topping looks so delicious as do all those whiskeys! I have never had this but I'm always on the lookout for new flavors to try out on my family. Great idea! You've made the fatal mistake and added an E. There's never an E in Scotch Whisky! I've never heard them called Neeps before! In fact, I've only recently heard them called Swedes. My family always called them Rutabagas. I wonder how many names these things have, haha! This recipe has so many new-to-me things. I've never had haggis (but always wanted to try) and this recipe has my mouth watering. Sounds delicious! Ahhh now I think that Rutabagas is the name in the USA so I'm guessing you must be based there. Hope you get to try haggis at some point. The glaze is amazing. Anything with that much butter, sugar and booze has just got to be - right?! You won't be disappointed - on both counts! Hope I've inspired to you celebrate Burns Night this year. Oh wow! Black Isle Brewery is literally less than 5 miles form our family farm. Perhaps you can pay a visit to Balblair on your next trip to Scotland. This sounds lovely! I make a steak, kidney and haggis dumpling pie, sometimes with diced steak and sometimes with mince. I'm definitely going to try the neeps! Your pie sounds amazing! Love the idea of combining haggis and dumplings. Think I may have to take inspiration from your pie. 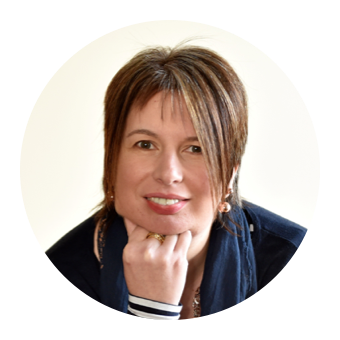 What a great idea Claire, particularly the whisky neeps, inspired! Slainte! Thanks Janice! I'm sure you'll be raising a toast to the Bard on the 25th so Slainte right back at you. Honestly Choclette you have to try it. No going back to mashed neeps after you do! you did make a moire traditional version aswell as the chocolate one. I have tried my friend's haggis balls and I preferred the vegetarian version for flavour., yours looks very special with the whisky steeped beeps on top. looks so colourful and tempting. It always cracks me up how autocorrect changes NEEPS to BEEPS! Absolutely had to do a twist on tradition as well as the quirky chocolate one. It's so delicious, can we use Scotch Lamb instead of Scotch Beef? or it will change everything, the taste I mean.